The boys haven’t really got the hang of this X-Factor thing. Ignored. 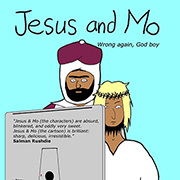 By Jesus and/or Mo. Is that a good or a bad thing? Oh how I wish they would. Actually, I wish their followers were as adept at ignoring as they. Oh, Patrick, How right you are! Are the boys about to plegiarise John Cage’s 4 Minutes 33 seconds? They’d better be careful, look what he did to Mike Batt! God’s the worst sidekick ever. With thanks to Tom the Dancing Bug. They must have enough tracks for a CD by now. Not much of which to be proud. My test for whether it is worth engaging in a discussion with someone, ask the question “what would it take to convince you to change your mind?”. If they say “you can’t”, you cannot have a discussion. If they say “evidence”, then there is a chance. Is it because they ignore you that they’re called ignorants? This one was quite fantastic. @KeithC Interesting. “what would it take to convince you to change your mind?” You can’t is my standard answer when people ask what it would take to convince me that the Christian God exists. Nothing would do it. I have to weigh the probability that this whole show was put together for human beings, with us at the center, and that we are somehow different from animals and “made in God’s image” against the probability that my brain was seriously malfunctioning. The latter is much more likely. It would be nice if we could trust our brains, but we can’t. Not even if given evidence. The best I can do is follow what makes sense and act “as if” I know. Of course the religious apologists say the same thing. Only what makes sense to them makes absolutely no sense at all to me. I’m sure FreeFox has more to say about this, but then he’s said it already. “Change my mind.”? I’m not going to waste my own time so someone else can waste theirs. If you can convince Dawkins or PZ then I’ll take some time to look at the claims for a god, God or Gods. @KeithC But what do you mean by ‘evidence’? It’s just shifting the question along, especially if people start qualifying ‘evidence’ as ‘acceptable’ or ‘repeatable’, or ‘falsifiable’, ‘Scientific’, or ‘Divine’. I may be old fashioned, but I’d settle for proof. Prove to me that gods don’t exist, I’d be skeptical, but I’d have to accept. Prove to me that God does exist, I’d be skeptical, but I’d have to accept. But then you have to understand the nature of proof, too. Given the weight of empirical evidence, I’d say that something(s) called god certainly do exist, but probably not in an easily perceivable way. But that is certainly not accept the luggage of belief systems, be they religious or scientific. Did you note that neither representative, Yeshe nor Ahmed, actually ignored the compere/audience? I swear occasionally, if annoyed. “If you won’t leave me alone I’ll find someone who will”. From Neal Stephenson’s latest book. Made me think of Author. Keep up the good work mon ami. No aspect of what was going on seemed as though it might be improved by communication with a diety. With the possible exception of, that is, that it might make her feel better. That, as far as she could tell, was the purpose of the religion she had been brought up in: it made people feel better when really horrible things happened, and offered a repetoire of class to such goings-on as shacking up with someone and throwing dirt on a corpse. None of which especially bothered Zula or made her doubt its worthwhileness. Making sad people feel better was a fine thing to do. That kind of religion did not have the power to make one give all of one’s money to a charlatan, drink poison Kool-Aid, or strap explosives to one’s body, but at the same time it did not seem to equal the challenges imposed by a situation such as this one. Since it seemed perfectly acceptable to her before, she didn’t feel it entirely proper, at a moment like this, to suddenly change into something more fervent. It was the praying-for-outcomes part she didn’t get. Since when did she have a vote? This boat would go wherever they pointed it. @Methuzla I think you’ve hit the nail on the head, at least in part. I suspect that nearly all atheists would accept the probability of god if the definition was simply “forces we don’t understand yet”. I know I would. It’s the extrapolation from that to a man in the sky who loves us and has us at the heart of his universe, yet allows bad things to happen, who sent his son to earth, killed him and then brought him back to life, listens to and answers prayers, created and decides who goes to heaven and hell, gave his perfect yet contradictory and apparently evil while good word to us without making it clear to all generations, and is perfectly understood when doing good things yet mysterious when doing bad, that I suspect most atheists have a small degree of difficulty with! I’m interested to hear what luggage you think science comes with though. Don’t get me wrong, it and some of it’s proponents are far from perfect I know, but I struggle to see good science as a belief system, unless you mean the belief that the scientific method is valid? At least science can produce demonstrable benefits. Beyond a warm fuzzy glow and some comfort when things go wrong (which could be achieved anyway if there were no believers), I don’t think the same can be said for religion. I read an article earlier today that I thought showed the best and the worst of scientific thought. I’d picked up in passing that some particles had been measured travelling faster than light, so I wanted to find out more. One of the articles I looked at was the from the Grauniad (http://www.guardian.co.uk/science/2011/sep/22/faster-than-light-particles-neutrinos). In there, I read comments from what I would call real scientists: for instance, Antionio Eriditato from the team announcing the findings basically saying “We seem to have seen this, but we could be wrong. Please will someone else check and tell us if we’re wrong”. This is a true scientist – he has released the information so it can be checked, following the maxim of “extraordinary claims require extraordinary evidence”. However, further down the article, we get to what I refer to as science-as-religion thinking from Heinrich Paes, a physicist at Dortmund University, who is quoted as saying “The neutrinos may be taking a shortcut through space-time, by travelling from Cern to Gran Sasso through extra dimensions. That can make it look like a particle has gone faster than the speed of light when it hasn’t”! This shows a determination to cling to a theory (admittedly a very elegant one, but still having the ability to be disproved when new evidence comes along) by inventing something for which there is no evidence (extra dimentions and the ability to travel between them), which may be true, but needs a heck of a lot more evidence before it can be considered. He also managed to deny that the particles might have, by any practical measure, travelled faster than light (got to the destination quicker than expected) by stating that they travelled faster than light (by taking a different route)! There are serious elements of religionist thinking in there that just reminded me that the bell-curve exists! As for Keith & Methuzala, um, the way I learned it (from the writings of Mr. Carl Popper, I believe) there is no postive proof, ever. No evidence. There is only negative evidence (showing empirically an exception to the theory) and theories not as yet falsified. We can know what is not, and must forever remain sceptical yet open to what still might be. @FF, I meant all religion. I probably don’t come here often enough to know your position; do you mean you think some religions achieve more? As much that’s of practical use as science? I don’t see it myself. I believe ministry in its general form can, but would do even better if divorced from the myths. PS, for ministry, I guess I could have substituted “spirituality”, so long as it doesn’t involve an untenable belief in something supernatural. @MarkyWarky you might find it entertaining to delve back into the archives and see the many comments by our friend FreeFox. As I understand it, his belief system encompasses quite a few deities, including several of the ancients gods, demigods, faeries and elves. He has said that God has spoken to him on occasion, but sounded rather bored. My theory is that he likes to yank our collective chains and is as much of an atheist-realist as anybody else here. But he’s perfectly capable of speaking for himself. Cheers DH, I rather like people like that!!! And anyway, who DOES’NT believe in fairies? I saw loads for myself at a recent Gay Pride parade in Brighton, so I KNOW they exist; I can even supply photographic evidence if required? @MarkyWarky I believe converting to gay requires an apprenticeship. There’s probably a bar in your neighbourhood where you could find some masters who would take you on. BTW, if you will pardon the blatant spamming, here’s a link to the FreeFox discussion I had on J&M, which I have preserved on my own site. Probably easier to find it there than in the J&M archives. @DH, thanks for the link. It was fascinating – way beyond me much of it, but fascinating none-the-less! @FF, thanks for the offer; I’ll get back to you on that one. I somehow intuitively agree with the rest of your post, but struggle to see how that’s anything other than a description of a metaphor? E.g., the metaphor of nature as “mother” points at large parts of reality, is poetic, and nature CAN be interacted with. Doesn’t make nature a real mother though. One thing I picked out of DH’s link that was interesting was the quote about atheists being like those who don’t “get” music. I think that sits well with FF’s description of his position above IF he’s describing metaphor; some won’t get the poetry and metaphor (I do), yet the METAPHOR is real. As with music; music is real and just a way to describe things, but those things don’t have to be real, and a person may not “get” the description. The difference is that an atheist does not deny the beauty of (large parts of) the metaphor, just literal belief in what it describes. I believe in and love Rush, but do not really believe that in 2112 we will be ruled by overlords who have banished all art, and that that will be overthrown by the discovery of a guitar! It’s just a metaphor for the value of art. In a way, every word in every human language is a metaphor. “Chair” is a metaphor for a large group of very varied objects all used to support your buttocks. The purpose is to illuminate and define a phenomenon out of a vast number of overlapping fragments of reality. Depending on your point of view any old rock or ledge or fallen tree can become a “chair”. In the end, “chairness” depends more on its use for us, than its “objective” reality. Just like the tree that falls unobserved, a chair unobserved is not a chair. Yet nobody would argue that therefore “there is no chair”. It is defined by its meaning, but it is nevertheless a valid definition. Gods are no different. Reality is reality. But we navigate it by chopping out chunks of it, grouping them, and naming them according to the meaning they hold for us. It’s not that atheists do not acknowledge the beauty of some metaphors, it is that they actually think some part of their reality tunnel is NOT a metaphor. I think there’s a large element of semantics in there, and your arguments could be used to make ANYTHING real. They are philosophising where no philosophy is required. IF, gods are whatever gods means to you, then they exist, just as souls and fairies and ghosts etc do, which is basically what I said in my first post in this thread. But unlike a chair, which has to perform a certain function in order to be a chair, even if chairs can be made up of any number of things that are not in themselves chairs or even intended as chairs, gods and souls and ghosts only exist in the sense that they ARE a metaphor for something otherwise indescribable. So, a god as described by Christians does NOT exist, but something I’d describe as god, does. It would have shared characteristics with your god/s, but would still just be a container for lots of “feelings” that dont actually form a “thing”; a metaphor. Ghosts in the sense of the actual bodyless beings continuing to “live” in a state of limbo probably don’t exist, but they do if by ghost you mean the memory, legacy, influence and/or love of a departed person, or whatever that person means to you once they’re dead. So sorry but I think your arguments are a cop out using language to “prove” the existence of something when we have perfectly adequate ways to describe what your talking about (umm, “metaphor”). By any normal definition they ARE metaphors, and that’s not changed when you refuse to recognise them as that. As you say, all words are metaphors if you want to argue that, so if that’s true then gods etc deffinately are, because we can’t point at a specific “thing” and say “there you are, there’s a god”, and have everyone agree. Hm. I am not certain whether I do not understand you or whether I didn’t make myself understood. Of course, just like “chair” has to describe something real, so does any deity. There is a neat bit in Neal Stephenson’s Cryptonomicon (that I referred to earlier) that makes this point about Athena and Ares: What they describe is a set of behaviours and experiences focusing either on smart or destructive ways of struggle. He also goes into how the same principle is viewed differently (and therby spawned similar but different deities) in different cultures – how Loki or Coyote are for example the old Norse or native American take on the same phenomenon as Athena. The purpose of worshipping Athena or Loki instead of just being a geek and be done with it, is that Athena or Loki have already been outfitted with a huge amount of subtle subtext, manuals, characteristics, morals, warnings, and whatnot, that mere geekdom would take generations to rediscover. Yes, everything I ascribe to God can be explained singlely scientifically, and I do not doubt any of those explanations (beyond the reasonable sceptical doubt I bear towards everything). The point is not for me to think about whether this my idea of God is in any way more or less real than scientific explanations. The point is that the collection of stories surrounding God, from the loss of paradise, via Moses, Jacob, Job, David (to name those most precious to me), to Jesus (who I have my problems with) and Paul, describe to me real, complex phenomena of life in the same way that classical or Norse mythology, Sami shamanism, or Romany “superstition” all can do it. So the term “God” for me has left the area of “mere” metaphor and simply become an accurate description for a set of experiences. If your last sentence is meant to mean that subjective experience is not valid, then we have to disagree very much. If you extend that principle to words like love, beauty, democracy, family, good, true, justice, eternity, darkness, humour, life, death, and everything else that decribes phenomena too complex for an encompassing single sentence definition, then, yeah. (And frankly, I doubt you could get every American even to agree on what exactly is included into or excluded from the group of “chairs”.) So? a figure of speech in which a word or phrase is applied to an object or action to which it is not literally applicable: when we speak of gene maps and gene mapping, we use a cartographic metaphor | [ mass noun ] : her poetry depends on suggestion and metaphor. Chair is not representative. It is an actual definable object, all be it one that’s a collection of other things. Chair can be USED as a metaphor (for rock that you sit on), but in it’s correct use it isn’t. God, unless you believe in a literal being, IS a representation of something (in my case, of “things we don’t understand yet”), and so IS a metaphor. So bottom line, you’re denying that what you describe are metaphors because, incorrectly, you believe “metaphors” and “things” are the same as each other, while literal Christians deny that what they describe is a metaphor because in a different way, they also cannot see the difference. And no, in normal language, i.e. language used as intended rather than with semantics applied to it the way theology is applied to the bible; to come up with a pre-determined result, atheists do not fail to recognise that some parts of their reality are metaphors. They can simply tell the difference. I get pretty fed up with the use of semantics to justify things. instead of applying intelligence to semantically proving your point, why not prove it in the language of your audience. In that language, what you describe are metaphors, and chairs are not. Sorry, crossed posts. Your first paragraph above describes, to anyone who is using language without semantics, a metaphor. The set of behaviours and experiences focusing either on smart or destructive ways of struggle is real, and you can call it Athena or Ares if you want, but there is not a being called Athena. I did not say “mere metaphor”, I said “metaphor”. A metaphor can describe something significant. The thing is, I think we agree. I think there is a very real collection of, umm, somethings, that can be called god. But that is NOT what most people mean by god, and so it is unhelpful to call it that. I am sorry you are getting fed up, but I still do not see how your definition makes “God” or “Athena” a metaphor. From the way I understand the definition of metaphor you provided it is such: A chair is not a metaphor because it ONLY describes chairs, while a gene map is one, because map “literally” describes something else, and the word is only loaned to describe by extension also a gene map. But God or Athena or ghost only describe one thing, like chair, namely a deity or psychic remnant. So how am I using it as metaphor? All I disagree about with literalist religious people is how that which we both experience as God is constituted and how the user’s manual to it is to be understood. If english would provide me with another neat, concise handle for, for example, the complex, painful, scary haunting effect the memories of my dead sister have for me, I wouldn’t need to call it a ghost. Science can explain these experiences, certainly, but all they do, to me, is explain how a ghost really works. Explaining how the lightning or sunrises and sunsets really work hasn’t invalidated the words lightning or sunset. They have only explained the mechanism better. Same with ghosts. Same with Gods. I never said my gods were metaphors. You said they were. I only said that if they are, so is every other word. But I agree with you, that neither chairs nor gods are metaphors at all. Just descriptions of reality. Where is your problem, mate? That wasn’t my definition, it was from the Oxford English Dictionary. You are using a metaphor because you are using the name of a thing (or at least class of things), as understood by most people and as defined in the dictionary (I’ll paste it below), to describe “a set of behaviours and experiences focusing either on smart or destructive ways of struggle”, and other collections. Those collections are not, by any normal use of the word, things, so if you give them a name that does normally apply to a thing, you have used a metaphor. I happen to think it’s a perfectly valid metaphor at least in principal, but it is one none the less. My problem, mate, is the dishonesty of what you are doing. You refuse to declare that what you believe in is what the word normally means, yet also refuse to accept that you are using it as a metaphor to describe something else. I don’t think you are dishonest, but I do think what you are arguing is. 1 (in Christianity and other monotheistic religions) the creator and ruler of the universe and source of all moral authority; the supreme being. 2 ( god )(in certain other religions) a superhuman being or spirit worshipped as having power over nature or human fortunes; a deity: a moon god | the Hindu god Vishnu. • an image, animal, or other object worshipped as divine or symbolizing a god. • used as a conventional personification of fate: he dialled the number and, the gods relenting, got through at once. 3 ( god )a greatly admired or influential person: he has little time for the fashion victims for whom he is a god. • a thing accorded the supreme importance appropriate to a god: don’t make money your god. @MW: I think I do use the word in the meanings 1 (though, I admit, I am not a Christian, merely a, hm, neo-gnostic Yahweist? ), 2 and 4 (for all other deities). I am quite distraught if I really give the appearance of dishonesty (if you read my exchange with DH you might understand why). I really do not intend to argue duplicitously. If there is an error in my argument, it comes from ignorance not dishonesty. I think I am using the word in the right way, though from a better understood, less childish perspective than the majority of users do (though I try to keep Dunning-Kruger in mind). I don’t want to cop out here – I could try to explain my actual belief, as an example – but I am uncertain whether that wouldn’t abuse this forum. If you want to, or feel I am trying to avoid the issue, maybe there is another form to continue the debate?